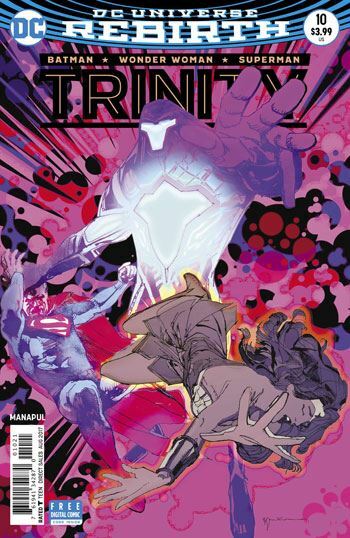 Trinity #10 really feels like a Justice League story, as opposed to a Trinity one. I suppose that is because it takes place on the satellite, gives a very good role to the Flash, and features Cyborg and Aquaman in small supporting roles. It’s not necessarily a bad thing that this feels like a Justice League story, it just does. 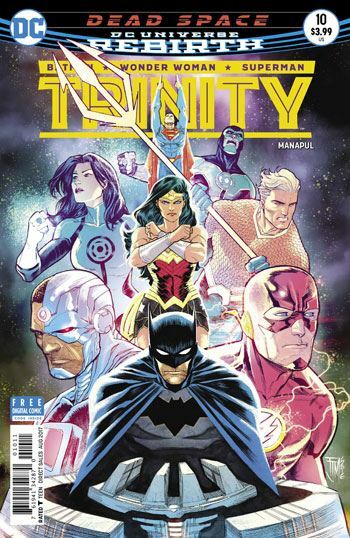 Manapul continues the situation from the previous issue, as various members of the League fall victim to a virus that transforms them into raging monsters. Batman is stuck dealing with that situation, while Superman and Wonder Woman deal with a different alien. That one explains to the heroes about the virus, how it affected the world he came from, and the drastic action he wants to take in order to preserve the Earth. Do you trust him? I don’t trust him. I don’t think he’s lying, I just don’t trust him. It’s a fun issue, fast paced and action packed. Not much time for any depth of characterization, though Manapul’s dialogue still manages to evoke the different heroes very well, and the Flash gets a strong moment of nobility. Because I do not trust the alien who is trying to fight the virus, I suspect there will be some more twists coming as the story continues. Certainly this issue ends with a strong twist to the situation.